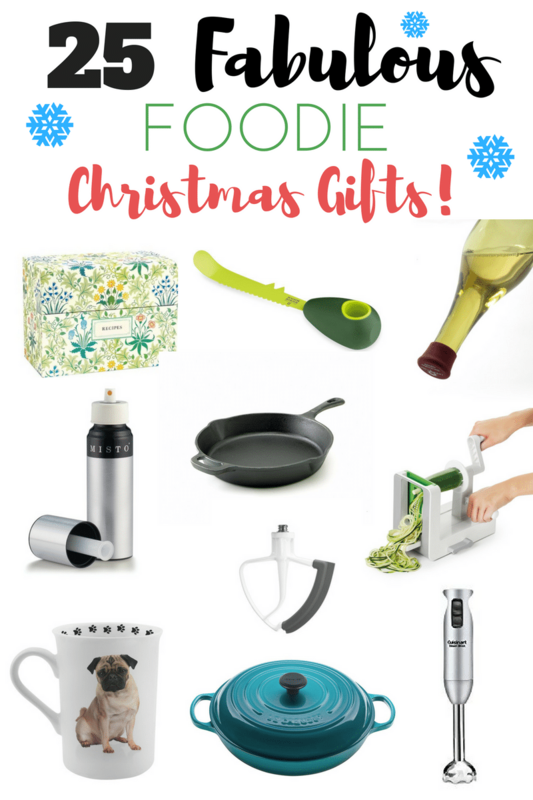 25 Fabulous Foodie Christmas Gifts! 25 fabulous foodie Christmas gifts that any food-lover, chef, or home cook would love to find under their Christmas tree! I use and love every single item on this list! Even though I still have Thanksgiving leftovers in the fridge, Christmas is in full swing at our house! We got our tree the day after Thanksgiving, and yes, I went shopping with the masses on Black Friday. I’m not one of those crazy people who line up for hours and run to grab the hottest doorbuster, rather it’s just a fun, relaxed tradition my mom and I have. We just like to shop together for fun, even if we only get a few sales and not the high ticket items that everyone else is after. My fiancé asked me for my Christmas list this year, so it got me thinking about all of my favorite tools and appliances that I already have and the ones I would love to find under the tree this year. So, if you’re trying to find the best Christmas gifts for that special foodie, chef, or home cook in your life, you’ve come to the right place! Only items I really love, and use all the time, have made it onto this list. Perfect timing with Cyber Monday coming up too. Get comfy in your pj’s, grab some coffee and do all your Christmas shopping from home this year! I started with a Vegetti handheld spiralizer. If you only want to spiralize zucchini and small sweet potatoes then that’s all you really need, but I wanted to try spiralizing larger vegetables. I did tons of research and I’m so glad I chose the OXO spiralizer! It has a giant suction cup on the bottom that helps the spiralizer to stay in place and I love that the blades are removable and are easily stored outside of the machine. I’ve been using it for months now with no issues. I’ve been able to spiralize zucchini, sweet potatoes, beets, butternut squash and acorn squash. Love it! If you have a dutch oven, you can cook anything! It’s my absolute favorite pot to cook in, I wish I had one 5 years ago when I was learning to cook. that I like better because I like to make enough for leftovers. works just fine and holds more than enough food for four people. My mom got this avocado knife for me last Christmas because I eat avocado toast for breakfast almost every day. I love this tool, and it’s so simple to use! It would make a great stocking stuffer too!
. I use it so often because it’s so efficient, and produces the same results as if I had spent all day cooking. Set it and forget it recipes are the best! would be a great gift for a college student, newlywed, a home chef, or any one just learning to cook. I’m sure there will be lots of great deals on theses for cyber Monday too, so keep an eye open! I don’t know why but I can’t cook rice to save my life. Every time I made it on the stove it gets a burnt layer on the bottom of the pot. It seems so simple, but it’s not! If you have too much water it will be mushy, if you don’t have enough water it will be hard and crunchy. Bleh. the rice came out perfect and I was hooked! I’ve also used it to cook pearl couscous and quinoa in a pinch. I use to mince garlic and ginger by hand but not anymore! /zester/grater is so much more efficient and clean up is a breeze. Now, I just grate right over the pot, tap it against the side to knock off any excess and rinse with water to clean it. It easily cuts my prep time in half! This would make a great stocking stuffer too! is easily the most expensive appliance I own but it’s so worth the price. It’s heavy-duty and great quality. You can just tell that’s it’s a quality product when you use it. It does a great job every time I use it, and I would never switch to another brand. I used the beater that came with my mixer for the first few months but I noticed that it was hard for the paddle to scrape the sides of the bowl while it was mixing. I would have to stop it and use a spatula to scrape the sides to fully mix it. has a flexible edge that scrapes the side of the bowl while it’s mixing. Problem solved! I like to make a lot of pureed soups, like this spicy thai cauliflower soup. is such a time saver! It has a guard on the bottom, so you can put it directly into the pot and blend everything up without hurting your pot. The blades are very sharp and fast, so it’s ready in just a few minutes. I use this tool a few times a month and have never had a problem with it. This braiser pan has been my dream pan for the longest time and I finally got one for my birthday! It’s true what they say, Le Creuset really is the best. The quality is so much better than anything else I’ve owned. It’s easy to cook with and easy to clean, I love it and wish I’d splurged on it years ago instead of wasting money on all the cheap pans I’ve had over the years. If you love grilled cheese sandwiches or making panini’s, then you need a Misto! The best way to get a flavorful crispy crust on your sandwich is by spraying it with a Misto. You fill it with your favorite oil and lightly spray the sandwich before you grill or press it. Instant crispy deliciousness! I’ve also filled it with coconut oil and used it to spray down my baking pans or muffin tins too, so convenient! I use. I prefer a hot sandwich to a cold one, so this press has its own spot on my small kitchen counter because we use it so often. Why go out when you can make your own gourmet sandwiches, like my favorite zucchini and avocado grilled cheese, at home! I know this isn’t exactly a “kitchen tool” but it’s so important to season your food while cooking and to use the best salt you can get. , I use it for everything. I prefer pink sea salt over regular table salt because it’s loaded with minerals, and it hasn’t been processed a million times like regular table salt has been. P.s – This would make a fabulous stocking stuffer, I’m hoping to get one in my stocking too!
! It works so well, and so fast! I make smoothies daily and I add whole frozen kiwis, apples, other frozen fruits, and it blends it completely within seconds. No chunks or lumps, just smooth pureed fruit. I also use it to puree soup in batches and to make my favorite cashew cream sauce. It’s easy to use and simple to wash. It comes with an assortment of cups and lids, so I didn’t have to buy any extras to use it. I love it, and it works much more efficiently than any other blender I’ve ever used. I’ve recently been making my own pizza dough and baking pizza at home. I first tried a pizza stone which works okay, but I like a light and airy crisp crust and that just didn’t do the trick. and it gave me the exact results I wanted. The air holes really help to lightly crisp the pizza without it being to hard or burnt. It comes out perfect every time! for my birthday a few months ago and I don’t know what I did without it before. I love that it goes from the stove to the oven to the table with no problems. It’s perfect to make a casserole, quiche, or cornbread in. It’s definitely a must have for any home cook! are the best solution for me, and they keep the wine very fresh. These make a great stocking stuffer gift!
. Since it has such a big surface, I’m able to cook large amounts of food in a short amount of time. Being a time saver is definitely worth the hassle of trying to store it. I use it to make pancakes, dumplings, burgers, bruschetta, and toasted crostini appetizers. and I’ll never go back to plastic. It can’t be good for you to use plastic with really hot food, so I’m much happier using these while I’m cooking.
. Did I chop everything by hand? I can’t remember, my brain is probably blocking it out because prepping food can be so tedious. as a gift will be so happy because you just saved them so much time! It’s very fast, and the blades are sharp. I also leave this out on my small kitchen counter because I use it so often. After dinner, I’m usually the one stuck washing dishes and cleaning up for hours, so I put this mat right in front of my sink. Its made such a difference! really helps to reduce the stress on my feet and back. I’m crossing my fingers that I get a second one for Christmas so I can put it on the floor in front of my cutting board! I LOVE, LOVE, LOVE my Snapware glass containers! I got my first one from Publix a few years ago, and was amazed by how well they worked. I immediately got rid of all my plastic containers and bought this full set. Storing food in glass is much safer than storing it in plastic, and I love how these containers stack together in the fridge. They’ve lasted for three years now with no problems. The set comes with an assortment of sizes and if you need a few more of a certain size, you can get individual pieces at Publix. I don’t really like having cookbooks because they take up too much room and I don’t have a lot of storage space. I mainly use Pinterest to find and store my recipes that I make a lot. on my desk. That way, I won’t lose or forget my favorite recipes and one day I can pass them on to my kids. Okay, this one isn’t a necessity but it’s so much fun! I don’t have a pug yet but I’m on the search for a pug to rescue and bring into our family! I just love drinking my coffee out of my puggy muggy in the mornings and what’s so cool about this cup is that you can customize it with any type of dog! So, this is perfect for the dog lover in your life! Keeping with the coffee theme, there is nothing I look forward to more than my morning coffee. I know this isn’t a cooking essential but it’s in my kitchen and I use it every day, sometimes twice, so it definitely counts! has fabulous customer service too. I had a small problem with my first machine, so I called them and explained the problem. They sent me a brand new machine, no questions asked. No problems since then and that was over a year ago. machine is so convenient and easy to use, and I love that I could use my own ground coffee. Plus you save a ton of money by making your own coffee at home! Well, there you have it. If I had to start all over, these are the top 25 items that I would buy or ask for first. All 25 items on the list are absolutely essential to any foodie, beginner chef, or home cook! I guarantee they will love any Christmas gifts you pick from this list! Did I miss anything? What’s your favorite cooking or kitchen essential? Let me know in the comments!